Stage-dive into the exciting crime adventures of Billy Lime, rock music bad boy and impresario. 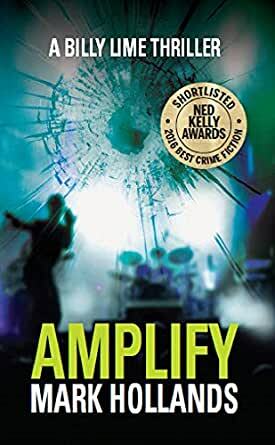 If you want fast-paced action, then you’ll love award-winner Mark Hollands’ latest rock n roll thriller. In AMPLIFY, Billy Lime bankrolls the global tour of Californian rock gods, The Pagan Virtue. On the road for more than a year, the band is at war with each other and Billy must keep them off the drugs, out of the bars and on the stage. When lead singer Jet Kelly is poisoned, and drugs are discovered stashed in music equipment, the cops mark Billy Lime as a killer and drug-runner. In a story that twists and turns, Billy must fight for his reputation and – ultimately – for his life. If you like Lee Child and Stieg Larsson, then you’ll love this cracking page-turner. Pulp fiction at its finest with a cracking rock n roll sound track. Find out why AMPLIFY is “guaranteed to get your pulse racing,” with 4.7 stars on Amazon and is celebrated by the Australian Crime Writers’ Association.